Sarah Bush is a choreographer in the Bay Area. 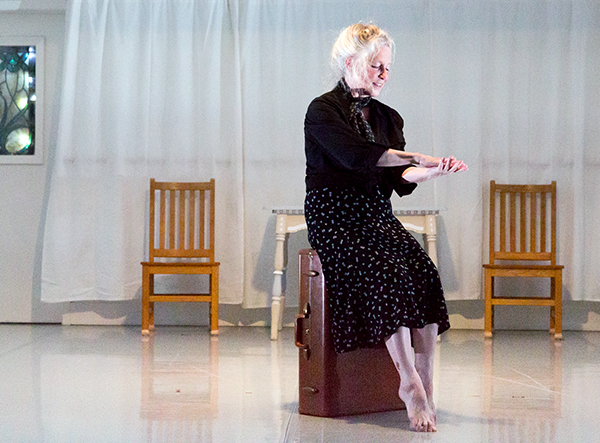 Her upcoming piece, Spirit & Bones, features an intergenerational cast of 15 dancers ranging in age from 23 to 71. The production highlights female resilience in times of darkness, the tenacity of women, and the strength generated by intergenerational community. Here, Sarah discusses her impetus, and two performers – Priscilla Regalado and Joan Lazarus – share their experiences. 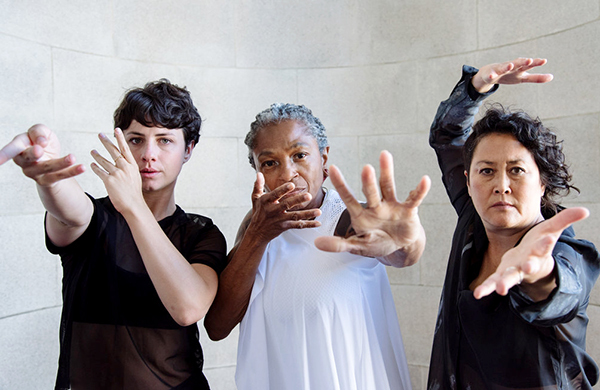 Performances of Spirit & Bones are October 26, 27 and 28 in San Francisco. To learn more, visit sarahbushdance.org. Why did you decide to choreograph Spirit & Bones? I grew up with the vision of running a year-round, full time dance company but, in the Bay Area, that’s nearly impossible. I have remained committed to having an annual home season and building a repertory of evening-length shows with my company. Several years ago, I started to map out a calendar of dances that correlated to certain times of year. People are inclined to have rituals around holidays, and I wanted to tap into that inclination to gather and provide an experience that hopefully touched on rich and meaningful aspects of the season rather than the plastic, commercial or superficial. After creating shows for Mother’s Day, Winter Holidays, and Fourth of July, I started diving into Halloween. Halloween falls during the time of year when things are dying off and days are getting shorter. It’s a time for endings, as well as beginnings. In some cultural traditions, autumn is the time of year when the veil between living and dead is at its thinnest. It made me question ideas about spirit and what lives on in a person after they die. As a dancer, I also find bones and skeletons miraculous and beautiful. So years ago, I came up with the title ‘Spirit & Bones’ because that was what was rich and meaningful for me about Halloween. After the soul-crushing results of the 2016 presidential election, I turned to the feminist classics on my bookshelf and got fired up to make new work. One feminist classic that resonated was Women Who Run with the Wolves by Clarissa Pinkola Estés. Every day, I’d sit and read from that book with the intention of creating Spirit & Bones in mind. It was like picking source material. It’s not that my choreography is based on the book, but that the book was a source of ideas that generated my own creativity. It’s been such a wonderful practice reading with a pencil in hand and writing in the margins to generate dance. Then, last year, for my 10th anniversary season, I decided to return to an older work and remake it. It had been a show about family dynamics, relationships, home and place. When I originally made the piece, it was done on dancers who were all in their 20s and 30s. When I went to remake the work, I realized that it would be impossible for a 20-year-old to perform the maturity that a grandparent figure called for. It became clear I would need to work intergenerationally. I had the great pleasure of working with Joan Lazarus and Sue Li-Jue, among others. To have Sue in her 50s and Joan in her 60s in the studio was life changing for me as an artist. It taught me how beautiful and valuable their years of experience are, both in rehearsal and in performance. As an adult, the majority of my professional performing career has been with Krissy Keefer’s revolutionary Dance Brigade. I was raised in theatrical, political dance that also became intergenerational. 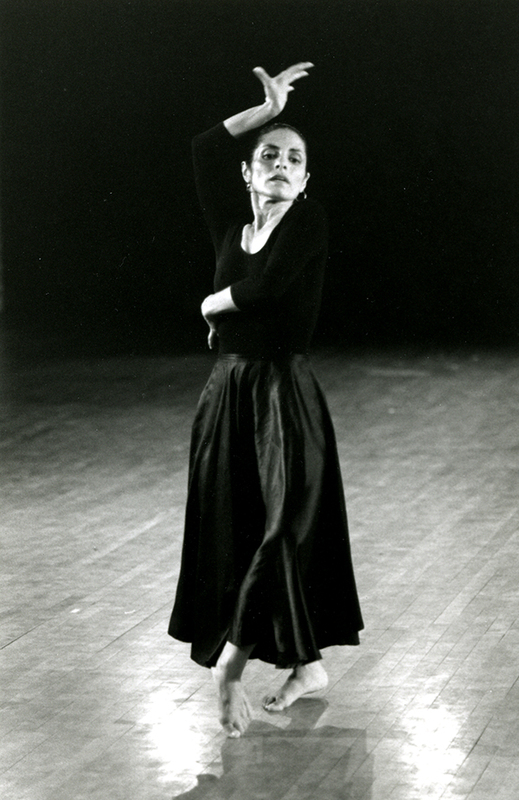 Krissy role-modeled directing work on dancers that spanned three generations. Coming back to 2016, it felt like that election cycle was a blatant statement of disrespect toward women. Hillary Clinton was a woman with years of experience applying for a job, and those years of experience were not deemed valuable. It made me want to make a show that specifically honored the strength, wisdom and experience of women. That’s why Spirit & Bones includes six women over 60, five women over 40, and four women over 20. There are separate sections exploring the unique wisdoms and strengths within those age groups, as well as intergenerational sections. At 42, I long to be around women artists who are older than me. I love seeing what is possible. More recently, after the Parkland shooting, I was impressed with young people across the country as they formed the March for Our Lives movement. They had incredible presence as speakers, leaders and organizers. It taught me that I need to be learning from people younger than me as well as older than me. I decided on the four youngest people in the cast because they are people I want to learn from. What has your process been like? One of the choreographic elements has been to have each of the dancers create some solo material that feels expressive of different aspects of who they are. What I am interested in is the ways each dancer is awesome and different. That means that, if we are making group material and something doesn’t work for a dancer’s body, I want to make a version that does feel good. That’s one reason why I wanted material to be generated by the dancers themselves. The elders have each created a solo that addresses the question: Who are the women you come from? Whether that’s dance teachers, other women in their lives, or even fictitious characters, I invited them each to create an autobiographical solo to that prompt. The middle-age group does a lot more unison movement, but they also did a similar solo exercise that addressed the prompt: What are you committed to? As bodies and abilities change, some things get harder, some things get better, and some things we let go of. I wanted them to look at what, throughout, they remain committed to. The youngest group created solos to the prompt: Describe the world you want to live in. I’m excited about the younger generation’s skills and abilities, and I want to know what they want to create. The youngest group is about uplift. They do a lot of partnering and working together to find momentum and energy. Each group spans 20 years so, even within the group, there’s a lot of different body dynamics to navigate. I think that leads to more interesting choreography. It’s been fun to look at how each group is really distinct, and then bring them together for a finale section. Because this piece hits on so many themes – spirit, feminism and intergenerationalism – what do you hope audiences take away? I want audiences to walk away feeling that things are more possible. I want them to feel a renewed sense of energy for whatever they are passionate about. The feedback that I’ve gotten is that it is important to see diverse women’s bodies represented in our art and entertainment. By having a range of ages, races and body types, the audience feels their own story or experience is being honored in some way. In terms of artistic growth, this piece presents exciting new steps for me. I’m working with costume, scenic and lighting designers in ways I never have before. It’s also my first time collaborating with a live band that is creating a completely original score. It’s an intergenerational all-female rock band called Skip the Needle. It’s a lot of new territory for me, and such an awesome joy. Why did you decide to get involved in Spirit & Bones? I was asked by Joan Lazarus, who I knew from the dance community many years ago. Out of the blue, she called me up, and said, “I have a proposition for you.” I had to think about it. I’ve been retired for eight years, and I just turned 71. After I stopped dancing, it took me awhile to come to terms with my decision. I decided it would be a lovely opportunity to reconnect with old friends and meet some new colleagues. I also liked Sarah and what she was doing intergenerationally. I myself wrote an article in 2011 about aging in dance. I asked what happens to all the older dancers. They just seem to disappear after spending their lives devoted to their passion. I thought this might be a perfect way to enter dance at this age and see what it’s like. What has been your experience thus far? The range of the oldest group is 60 to 71. When I was 60, I could still do almost everything. I taught full out until I was in my early 60s. I now have two hip replacements. My body is not the same as it was at the age of 60. Everyone was asked to make a one-minute solo, and out of that solo would be two or three gestures we would all have to learn. I can’t go to the floor and get back up again over and over, so I have to modify. I love that Sarah is willing to acknowledge where we are in our lives and make the piece work for all of us. I want this to be a joyful experience and dance where I am now. Is there a movement quality that experience alone gives a dancer? Let me share a story. About 15 years ago, I went to see a concert by White Oak Dance Project that featured Twyla Tharp and Mikhail Baryshnikov. It was the two of them and a company of young ballet dancers. Tharp and Baryshnikov were extraordinarily amazing even though they weren’t their former selves. The ballet dancers, in comparison, could do multiple turns and lift their legs, but it felt like: So what? They didn’t have any depth and emotion in comparison to Tharp and Baryshnikov. There’s something else beyond all the tricks. I love watching young bodies dance; they’re beautiful. But there’s a difference in what a younger and an older body brings to the stage. I’m really going for the internal intention of what I bring to my movement. Why did you get involved with Spirit & Bones? Last year, Sarah put on a concert called Homeward. She was looking for older dancers, and I had two students in my class who wanted to audition. I decided to go along for support, but they didn’t show up. I was the oldest person in the room, and I ended up doing the concert with Sarah. That was really fun, but I let Sarah know that if she wanted to involve older dancers again, there were some guidelines she needed to follow. We don’t rehearse at night, and not for more than an hour and a half at a time. These guidelines keep us safe. One of the most dangerous things, for me, is doing another person’s movement without having studied with them. If there was a way for people to feel safe in their own bodies, I let her know I could help recruit older dancers for her next work, Spirit & Bones. I recruited a number of my colleagues for the piece. I admit that I played them against each other, saying one would do it if the other agreed, but it’s wonderful to be in the studio with them again. Some of my colleagues I’ve known forever but have never performed or rehearsed with. It’s almost a spiritual experience to dance with them; it’s like going home. We were trained differently than someone 20 years younger. We have the same lineage and recognize each other’s layering. Then there are the people I have worked with extensively. It’s the kind of treat I never thought I would have at this time in my life, getting back in the studio together. It’s such a gift that Sarah is giving us, and in a way in which we can’t fail by showing who we are with our own movement and lineage. It’s a real gift to have our age appreciated in a circle of women. A number of people in the middle-aged group have been my students, and some of the dancers in the youngest group are the students of the middle-aged group. When I saw three of my former students rehearsing together the other night… if that was the only thing that happened for me out of this whole experience with Sarah… I never thought I’d get to see that again. Dancers know each other through kinesiology. I remember how they move. There are a lot of these moments that aren’t part of the choreography itself but are the payoff for the people in my age group. Everyone in my age group in Spirit & Bones believes: This is the dance I do now, and I’m not trying to do something I used to do. Over a lifetime of dancing, it’s my job to ride that evolution with a willingness to be seen and to share. I love the dancer I am now because it’s more integrated, more than in the days when I was trying to maintain a certain technical level. I wish it didn’t hurt so much afterward, that I could dance longer. It would be nice to have a younger body, but only with what I know now: It’s not about what I can do, it’s about who I am.